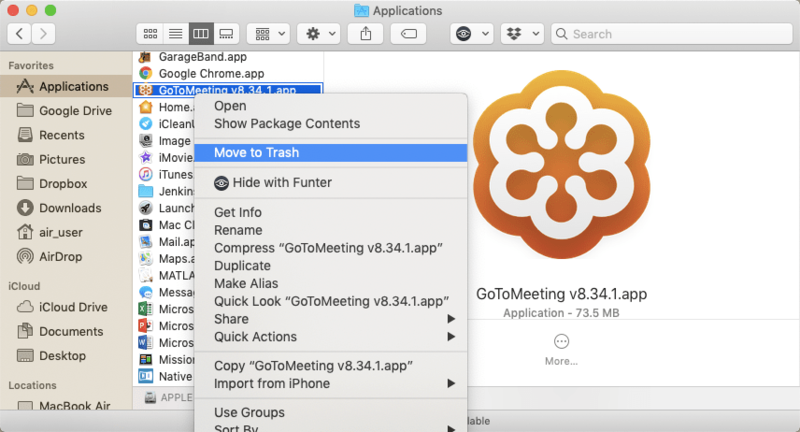 If you want to remove the GoToMeeting application completely, you should note, that just dragging and dropping the app to Trash is not enough. You need to remove the associated files as well. That’s why we recommend that you learn our guide on “How to uninstall GoToMeeting on Mac” in order to do it efficiently and safely. 1. How to remove GoToMeetings on Mac manually. 2. How to uninstall GoToMeetings using App Cleaner & Uninstaller. Remove the executable file. Open your Applications folder → select GoToMeeting.app → make a right click and select Move to Trash. Remove service files. The service files are located in the hidden Library folder. To have access to the Library folder, open Finder → click on Go in the menu bar → select Go to Folder in the drop-down menu → type the path ~/Library to get The hidden Library folder. 5. To remove the GoToMeeting application completely, do not forget to empty the Trash folder. Choose the GoToMeeting application. All its useless service files and folders will be selected automatically. Click on the Remove or Uninstall button. Review the items you want to delete, and confirm removal by clicking on the Remove button. Empty the Trash bin to complete the GoToMeeting uninstalling process. Uninstalling an application can be simple or complex, as shown above. It’s your decision whether to uninstall apps on Mac manually or automatically. However, App Cleaner & Uninstaller is a good choice if you want to save time and delete an app correctly.